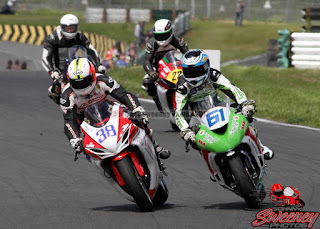 Three thrilling Supersport races were the highlight of the third event of the Masters Superbike Championship season at Mondello Park on Saturday and Sunday (June 24th &25th). Jason Lynn closed in on Supersport series leader Ross Patterson with his third and fourth wins of the year while Korie McGreevy took his first ever Masters win in the final race of the weekend. 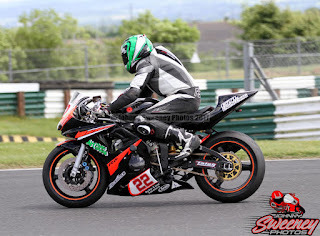 The Superbike class was dominated by Yamaha R1 machines as Richie Ryan's Mobil 1 supported example beat the IFS bike of series returnee Robert English. Ryan took his first ever Superbike win on Saturday and followed up with two more comfortable victories on Sunday. Saturday's first Supersport race set the tone for the weekend with a fantastic dice developing between pole sitter Aaron Clifford, Jason Lynn and Korie McGreevy who at one stage went from third to first and back to third in the space of a lap and a half. At half distance the order settled down and remained the same till the flag, as Lynn took his third win of the season from McGreevy and Clifford. 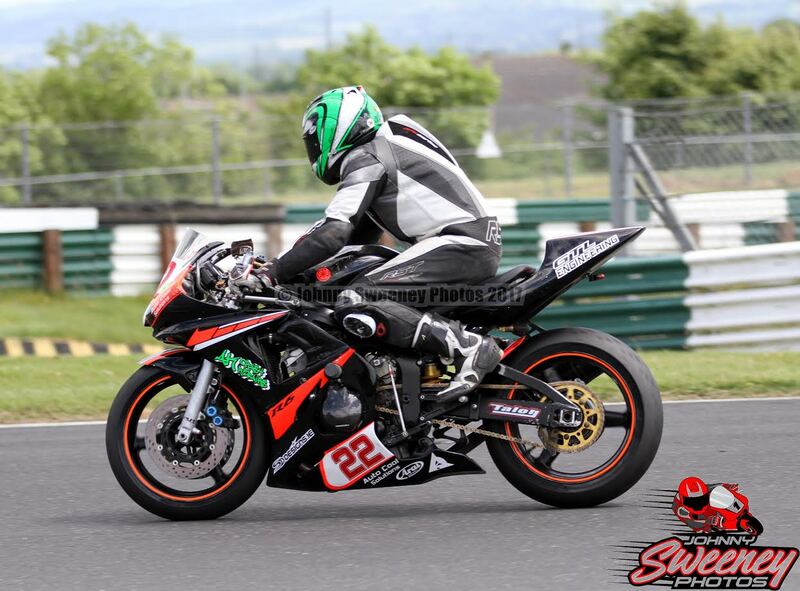 Eunan McGlinchey took the Cup class following a strong ride from eleventh to fourth. McGreevy took pole for race two and was once again in the lead battle which initially included Lynn and Patterson. By half distance Clifford had joined in, with McGlinchey also on the tail of the lead group, when the race was stopped. Off the restart, Ross Patterson finally got back to running at the front and held sway for two laps before Lynn took over. McGlinchey was running third when the red flag flew once again, this time due to McGreevy falling off. With the result declared McGlinchey became the first 'Cup' rider to finish on the podium at the Masters while Lynn's second win of the weekend made it four in a row and moved him right onto the tail of Patterson in the championship. McGlinchey's progress continued in the final race as he got away best from row two, to lead for the first three laps. Behind him a furious seven bike lead battle was raging and eventually the experience of his rivals told as one by one they slipped by. On lap eight of fourteen McGlinchey fell exiting Bridgestone corner, taking Clifford with him, and this split the field leaving McGreevy, Lynn and Patterson clear of the rest. Despite immense pressure from behind, McGreevy held on to take his first Masters win while Lynn closed the championship gap to just five points by beating Patterson to second. McGlinchey's fall left Luke O'Higgins to take his first 'Cup' victory and his best ever finish in fifth place. 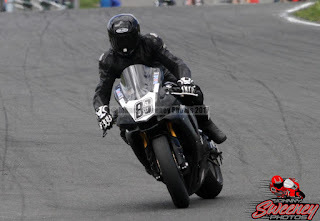 The Superbike races were all about Richie Ryan as he took a trio of wins with his Mobil1 backed Yamaha. Ryan, who had never previously won a Superbike race, took pole for all three and won each comfortably to open up a huge championship lead. The pace in Superbike has upped massively since the start of the year with Ryan's lap times now regularly dipping into the fifty three second bracket, more than a second faster than his best lap in the season opener. As Ryan cruised to victory, even the returning Champion Robert English could not match him and had to settle for three runner-up spots. The final place on the podium was shared between three different riders over the three races. Gerard Kinghan was third on Saturday while Luke Johnston recovered from a very poor start to climb onto the podium for the first time in Sunday's first Superbike race. It was Peter Moloney's turn to finish third in Sunday's second race as held off another recovery drive from Johnston. Ryan now looks unstoppable as he leads the championship by more than eighty points from Charles Stuart with Mark O'Byrne third. The Superbike 'Cup' wins and the championship lead all went to Andrew Murphy who continues to get in among the Pro riders at every round. The riders in the Principal Insurance Pre-Injection class took their lead from Supersport as they produced the closest racing seen in the class for many years, apart from Alan Kenny who ran away with the lead in all three races. Behind the triple winner the battle for second to seventh in each race was frantic from lights to flag, with different riders appearing on the podium on each occasion. Joe Grant collected the most points of the championship front runners to move back ahead of Darryl Sharkey at the head of the field. The Masters returns to Mondello Park's National Track on July 14th & 15th as the championship celebrates its 100th race. To mark the occasion additional cash prizes will be awarded to each class and details of this will be announced over the coming weeks.